As a research intensive department, we have over 100 graduate students, 21 faculty members, and numerous Research Assistants and Postdoctoral Fellows. While our faculty teach courses, they also carry out research, supervise graduate students, and collaborate with industry. Our research ranges from theoretical computer science to practical applications, leading to solving real world problems. Following is a glimpse at multi-disciplinary research projects. 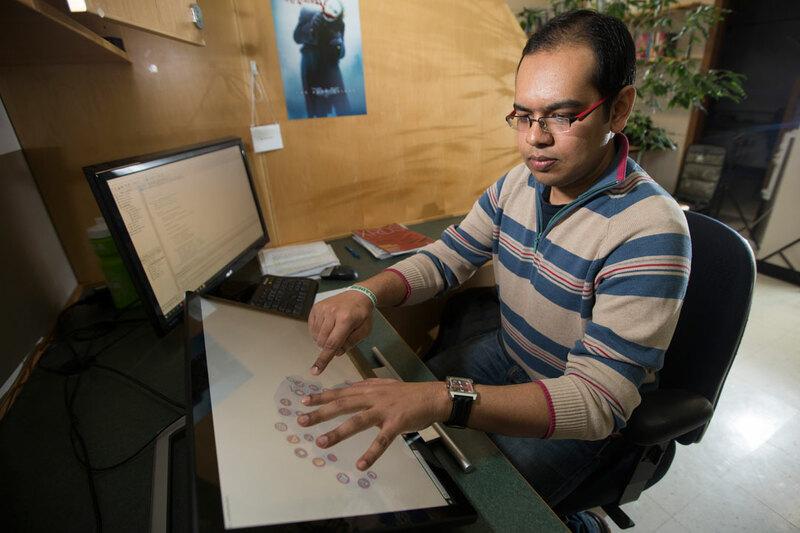 Computer Science PhD student Mohammed Sami Uddin has developed a new multi-touch menu called HandMark-Finger. This interface is designed for large touchscreen devices such as tablets and makes it easier and faster to input commands. Uddin's innovation makes input approximately thiry percent faster. The researchers have found that by speeding up human interaction with devices and fitting in more commands, HandMark-Finger may have real-life applications in devices such as tablets, computer desktops, and smart TVs. Users have to touch the screen palms down. Different sets of commands then pop up around the fingers. Users use all of their fingers to interact with the screen, instead of the more common one or two finger tapping and swiping. Since the menu is based around users' hands, it helps them remember the location of commands with fingers serving as memory cues. Uddin has tested the menu with thirteen users and results show that the time needed for learning how to use the menu is similar to current devices with similar error rates. Currently, HandMark-Finger comes with approximately forty commands. While more research and re-design is necessary before it could reach commercial devices, initial results are promising. The focus now is on how to best group commands on screen and look at conducting a large scale study. The project is funded by NSERC and is part of the U of S Interaction Lab. 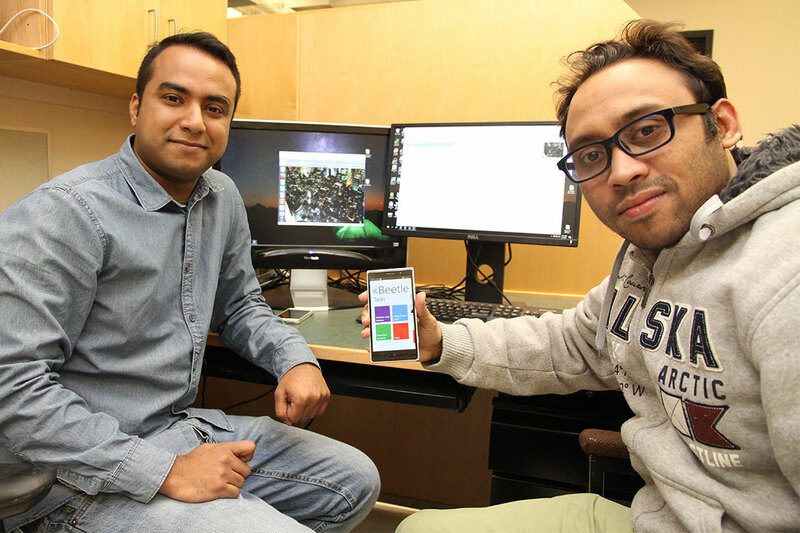 Rahat Yasir, a MSc student in the Department of Computer Science, is building a mobile application called Project Beetle. He has partnered with fellow MSc student Rashid Chowdhury. Yasir was inspired to create the app after speaking with a farmer from the Tisdale area. He listened to the farmer's stories of walking through crops, checking for signs of disease, pest infestation, and areas that required herbicide or fertilizer. All of which is a very painstaking manual process. 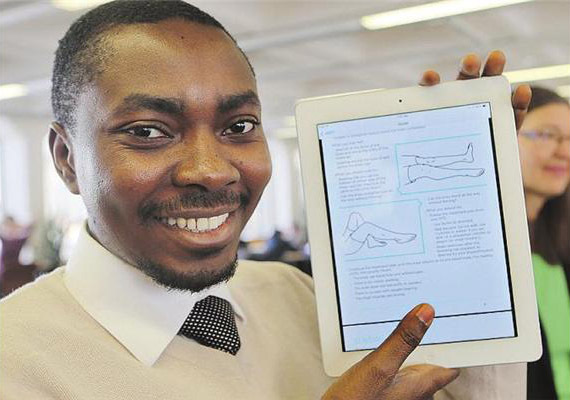 His app will allow farmers to survey crop health with efficiency. The app works like this: a farmer takes a photo of a leaf and the app scans it. Then, it provides a breakdown of possible health issues, such as potential diseases, nutritional information, and an estimate of how much of the surrounding crop is similarly affected. The app makes use of artificial neural networks. This has allowed them to compress their entire informational database on different crop diseases directly into the app itself. The app can therefore function even without access to the internet, although it does become more expansive when running online. Next steps including hoping to partner with others working in similar areas, or with government agencies that could grant access to data on crop diseases. The app earned first place at the January 2017 Emerging Agriculture Hackathon. It also earned 5th place at the 2017 Pitch Party - a way to connect creators, innovators, and entrepreneurs from across different backgrounds, showcase local startups, and get attendees thinking creatively and building ideas. Very recently, a new paradigm has emerged in the design of new materials: rational design. Rational design of materials refers to the use of computer simulation, through solving quantum mechanical models, in order to predict the properties of a material from its atomic structure. The idea is that if a mathematical model can reliably predict the properties of a material, one can use supercomputers to efficiently search the space of possible atoms and their positions to construct materials that have optimal properties. Rational design reduces the propose-test-modify cycle and gets new materials from the laboratory to the marketplace in far less time than traditional methods do. Rational design is already an indispensable part of the aerospace, automotive, and pharmaceutical industries. Using rational deisgn, Dr. Raymond Spiteri and his Simulation Research Lab are researching materials harder than diamonds. New materials have fed technological innovation throughout human history. A million years ago, humans searched for materials that could burn easily or were harder than rock. Today, the quest is for materials that are harder than diamond, more conductive than silver, or more insulating than aerogel. The classical way to design materials is through experiments. Experiments are expensive, slow, often hazardous, and require a significant amount of human expertise and intervention. Success can often be directly attributed to the experimentalist and the equipment. However, these two success factors are also the two greatest limitations on the materials that can be discovered. In this project, we propose to discover new materials that can be fabricated under high pressure and have superior material properties such as hardness, thermal power, ductility, and malleability. A significant advantage of developing our own software for this problem is that we can incorporate aspects like cost of manufacturing or impact on provincial or national economies. So for example, a material it may be more valuable to discover a material that is only 80% as hard as diamond but costs only 20% as much to fabricate. As a first specific example, we are attempting to design a material that is harder than diamond. We have spent around 10,000 CPU hours (just over 1 CPU-year) on this problem so far (and counting!). The search is made extraordinarily challenging because it is fragile: it is not possible to extract meaningful information from an arbitrary configuration of atoms, i.e., configurations that are too far from something physically reasonable. We expect it will take at least one hundred times more CPU time (so about 1 CPU-century) in order to conduct a reasonably thorough search of the design space. And it is of course not guaranteed we will be successful. That's why it's called research! Few leisure activities are accessible to institutionalized older adults who rely on wheelchairs; in consequence, they experience lower levels of perceived health than able-bodied peers. Video games have been shown to be an engaging leisure activity for older adults. Kathrin Gerling, Michael Kalyn and supervisor, Dr. Regan Mandryk addresses the design of wheelchair accessible motion-based games in their research. Dr. Mark Eramian is a member of an international team of researchers who are investigating interactive systems design in conjunction with image processing and text mining techniques to help archaeologists find, organize and analyze the thousands of images and document resources available to them to answer archaeology-based research questions. Current archeological data banks are so large that it could take several lifetimes for an archaeologist to find specific answers. Images are typically searched by keyword, which has serious limitations. These searches depend on metadata: descriptive text that is added to the image files when they are uploaded. When an archeologist types in a key word, there are no guarentees that the items they are looking for in the data bank are tagged with the same metatadata keywords, or if the items are even tagged at all. If the quality of the metadata is poor, text-based searches will not suffice. Eramian’s contribution is in image analysis, something he has applied to everything from high-resolution ultrasound of the reproductive tract and microscope images of cancer cells, to technology to help farmers seed crops more efficiently. For this project, the challenge will be to create an image-based search that recognizes shapes, even if they are only partially there or seen from different angles. They will need to determine which part of the image actually contains the object, followed by analyzing and recording shape, color and texture properties. Men with mild forms of the bleeding disorder hemophilia sometimes have trouble telling when an injury may lead to crippling complications like swelling, pain and immobilization. Richard Lomotey, a Computer Science Ph.D. candidate, and his supervisor Dr. Ralph Deter developed a mobile application designed for individuals with hemophilia, a genetic disorder that prevents blood from clotting properly. The mobile application "HIRT? ", the Hemophilia Injury Recognition Tool, allows users to check their symptoms for warning signs, see suggested treatments, then receive alerts to check their injury for changes. It also includes emergency phone numbers for every hemophilia treatment centre across Canada, in case they’re travelling. The application was developed in collaboration with the Saskatchewan Bleeding Disorders Program. Andre Doucette's research focuses on human behaviour and how the design of digital systems can affect the mannner people interact with systems. Specifically, this research project investigated how people coordinate the use of physical space above a tabletop, and how it translated into the digital world. From his research, touching digital tabletop embodiments is not as awkward as it is to touch a physical arm. In collaboration with the Human-Computer Interaction Lab, Andre developed a set of augmented tabletop embodiments to try to introduce some of the automatic coordinative benefits of physical arms into digital tabletop systems. For his Computer Graphics (CMPT 829) project, Mike Sheinin wanted to learn all the steps involved when creating a 3D character animation. He started with a 3D character model, gave it a skeleton so it could move, then used key-frame animation in Blender to acheive the finished product. This project was developed for CMPT 829: Computer Graphics, taught by Professor Ian Stavness. Mike chose this project to learn something that would hopefully be beneficial in a future career in video game development. Learning how 3D character animation worked gave Mike hands-on practical knowledge of the techniques and tools that professionals use to create 3D movies and games. Throughout the project, Mike enjoyed learning about the history of animation and how it has grown with the use of computers. He was interested to learn how animated movies are created, such as Toy Story. The 3D character animation was developed first with a 3D character model, which then was rigged to give the model a skeleton. The character was skinned and connected to the skeleton. Finally keyframe animation in Blender was used to get the finished product. The bulk of the animation was developed using Blender, a free open-source 3D graphics and animation software. The original character model was created from blendswap.com, a great resource of Blender-specific models. When asked if he had more time and money to work on this project, Mike would create more animations for this character, such as running, jumping, throwing, etc. He envisions his charatcer being used as a common animation seen in a variety video games. If he could create multiple characters, then he could eventually create a new game using his own animations. It has always been a mystery to Mike how to make his own 3D game, but now he has the skillset to create one himself.